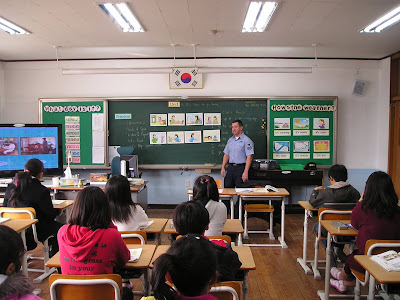 Recently I began teaching English at a local Korean elementary school. It is part of the U.S. Navy's Community Relations Program which is sponsored by the base chapel. I volunteer my time so that I can help the kids, let them get familiar with American style English speaking, and because I want to get involved in the community. I didn't replace the existing teacher, I just show up once a week as a guest to their class. The kids are great and the teacher is really nice. I didn't realize teaching could be this much fun. The classroom is set up pretty much the same way that it is in the U.S. but these kids work on English from the time they are very small and up through college. The teacher warned me that the kids can be a bit wild at times.......so I provoke the wildness and try to get them into our session. The kids are very respectful and most approach me at the end of class and thank me for being there. yeah!!! its always fun being a teacher..
and seems like those kidz have a snappy teacher in you huh...great job dude..
wow good job, jhonny! hehhehe....never thought Rose married a teacher...hehehe..hubby was once a high school teacher as well...:) keep it up! That is so great of you Joops to volunteer as an English teacher even once in a week. I have learned not too many koreans are good of speaking english... I used to watch their movies or kdramas and some of them are afraid to be asked by foreigner especially when speak english... 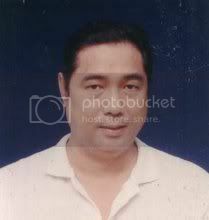 In Cebu Philippines a lot of Koreans went there just to learn for it. Oh well, Congrats on teaching them! You will be such a great help! You may keep it up! Teaching is a noble profession- one that molds characters of students. Someday your imprints on their souls will have a profound effects both on the teacher and students. Thanks for the post. God bless you always. keep it up teacher johnny! wow, wasn't that fun, Joops, I always want to do this kind of volunteer as English teacher. wow, teacher profession is challenging,be proud of it. I cannot imagine a more worthy proffesion. To be the one teacher that inspired a child to make the most of his/her talents. 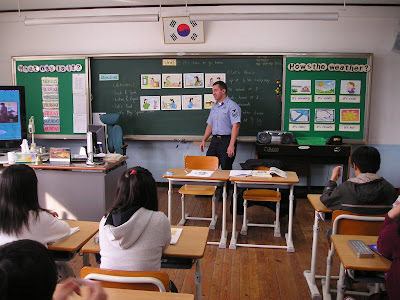 I should imagine that the Korean kids were a damn sight more respectful than the sorry sights and sounds that can be seen and heard in most western schools. wow! it's nice to know that you're enjoying it although it's just a part time job. 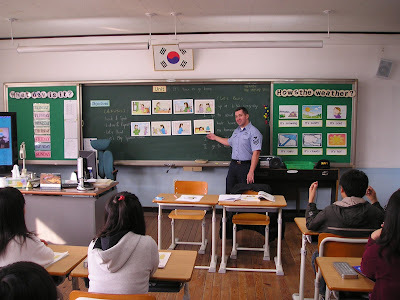 is there a language barrier when you teach the korean kids? wow! salute you buddy! yep, it's fulfilling! It's a noble profession! thumbs up man! I am happy you had fun! here visiting again :-0 have a nice day tomorrow! Yehey!!!! being a teacher is always fun if you know how to live with it... it makes you grow younger LOL! i'm wondering who got that that snap for you John... YOu look so perfect teacher huh! It is indeed fun but mine was and still are mostly tutorials for kids... only once i volunteered for high school students ans a few times with Korean students in the Philippines. by the way, i find teachers cool! they have this overflowing patience in them! Hi! Thanks for the message that you left for me, it calmed me and it made me think. They say teaching is the most noble profession, because without them there would be no doctors, lawyers etc. It was nice to hear that you enjoy your teaching stint! Keep it up! Hi Borneo, yeah I can say that teaching is a noble profession..
Hi Pajay, i was happy that the children cooperated with me hehehe.. They actually listened and interacted with me..
Hi dhemz, oh wow, you and rose must have had a sisterhood, you have a lot of similarities hehehe..
ohh, that's so nice of you to volunteer as a teacher.. I can tell from the pictures you had fun!! Kudos to you man, and keep em coming!! I'm so proud of you hon! Thanks for dropping by Malou! Hi Weng, I agree with you! How's your vacation there in PI? You're absiolutely right Moannie, they are very respectful and very interactive too... Yeah, I commend all teachers who really give their innermost time teaching and honing children's mind..
Hi Jasmine, it was indeed hehehe.. thanks for visiting..
A little bit dong ho, they barely say english but they tell you the basic..
Hi Sunny, thanks a lot for always visiting and commenting..
Oh wow, that's very nice of you Ms. Gengen. I would like to take your offer if it won't be a hassle to your schedule hehehe.. Thank you so much! Thanks for visiting and commenting Pchi and Cecille.. Thanks Tikno and maricel deMaio.. I agree with you Cely, I think no matter profession you have as long as you enjoy doing it, you'll not gonna go older fast hehehe..
Hello Iceah, thanks for visiting..
Hi Webbiegurl.. The teacher was the one who took the picture hehehe..
Oh, is that really, who said that... Whoever said that must be envious of you hehehe..
Hi Maxi, thanks for dropping by..
Hi paupau, am glad you're okay now. hi grace, thank you for the kind words! Teacher are really great because without them we will learn nothing. OMG! That is so amazing Joops. Teaching is really fun and i miss that. Good job and may you have more enjoyable learning inter-action with your pupils.